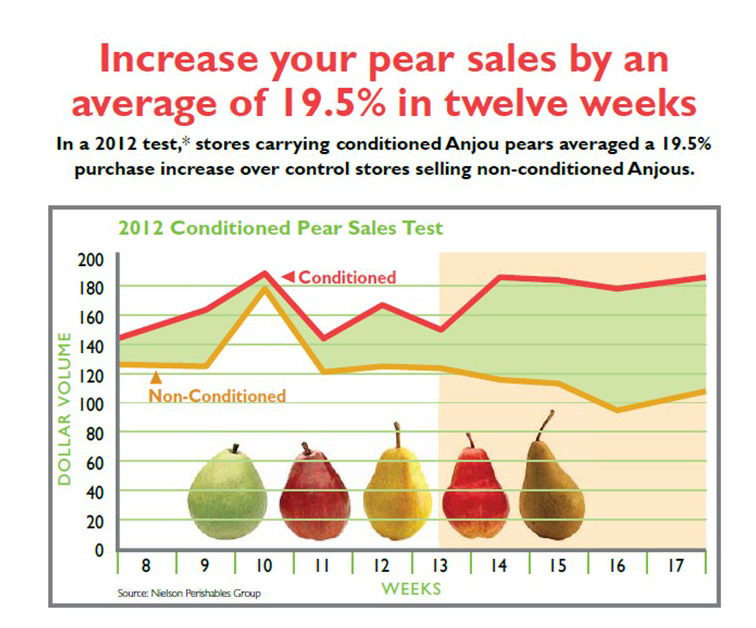 What can conditioned pears do for retailers? We live in a ripe-and-ready, “want-it-now” society. This means many produce shoppers only buy fruit they can eat immediately or soon after purchase. 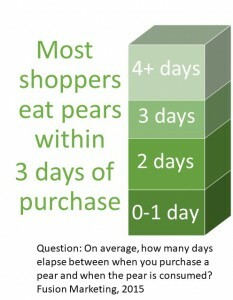 Studies show 50% of pear buyers want to eat their pear within 2 days of purchase, and 71% consume them within 3 days of bringing them home. Retailers have the opportunity to satisfy consumer desire by displaying conditioned pears. Consumers are shopping at multiple retail outlets these days, so a retailer that is known for consistently ripe fruit can capture more of the consumer’s dollar and place them ahead of competition. The pear industry uses the term conditioned to describe pears that have been brought to the “just starting to ripen” state. The conditioning process is a completely natural one. Pears are placed in a ripening room, warmed to room temperature, and treated with ethylene (which naturally occurs in fruit as it ripens). They are then cooled back down. Conditioned pears that are cooled to 32F to 34F will stay firm throughout the storage and shipping process and won’t dramatically ripen further until placed back at room temperature. Conditioned pears can provide more consistent texture and flavor throughout the box or load. Conditioning can also enhance the sweet and juicy flavor pears are known for, providing an enjoyable eating experience and bringing shoppers back for more. Why should retailers condition pears? It’s easier to condition pears than retailers think and the rewards are big. 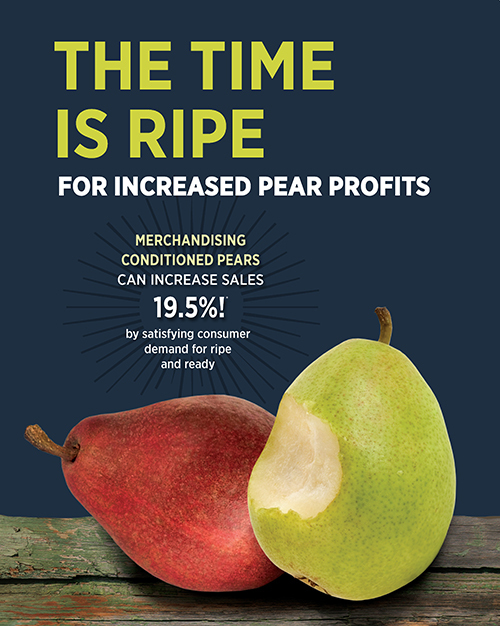 In-store research has shown that ripe pears can outsell unripe pears by 19.5% (Nielsen Perishable Group, 2012). 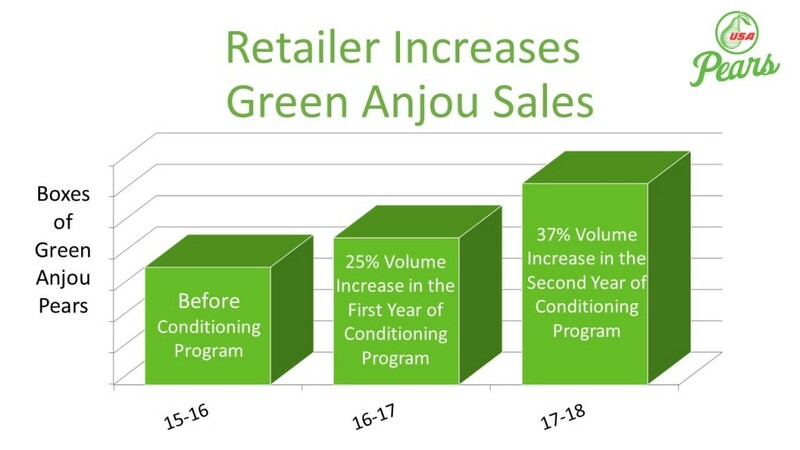 One retailer that is working with Pear Bureau Northwest reported a 25% increase in Green Anjou sales after the first year of merchandising conditioned pears and a 37% increase after the second year of the conditioned pear program. In addition to the profit potential, a conditioned pear program also gives consumers what they want: sweet and juicy pears without having to wait. They will come back sooner for their next purchase because they are spending less time waiting for pears to ripen. How can interested retailers get conditioned pears? Conditioned pears can be purchased from many shippers in the Northwest or a retailer can do the conditioning in their banana ripening rooms. Pear Bureau Northwest has resources to help in either case. For example, our ripening consultant can work with the receivers at the distribution center, educating them on how conditioned pears may arrive differently. Our consultants can also train the retailer’s ripener on how to use the banana rooms for conditioning pears. The process is similar to ripening bananas or avocados. We have a complete training manual to walk retailers through the process as well as best practices for merchandising conditioned pears to the shopper. How do retailers start conditioning pears? Getting in touch with PBNW is a good start. We are a resource for all retail pear questions. We provide customized seminars for retailers, teach employees the key steps, provide materials, and serve as a sounding board for ideas. 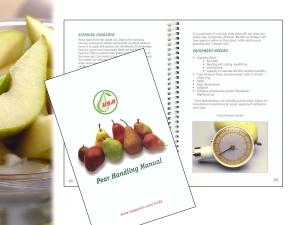 For complete handling materials, download our Pear Handling Manual here.